M. S. Subbulakshmi: Madurai Sanmukhavadivu Subbulakshmi (16 Sept. 1916 – 11 Dec. 2004) was born in Madurai and died in Chennai. She was a renowned Carnatic vocalist. 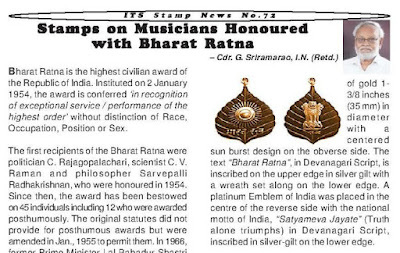 Subbulakshmi gave her first public performance, at the age of eleven, in the year 1927, in the 100 pillar hall inside the Rockfort Temple, Tiruchirappall. Many a home in India, and it is not an exaggeration, start their day with the rendition of Venkateswara Suprabhatam and Vishnu Sahasranamam rendered by the Nightingale of Carnatic Music. Read More…. 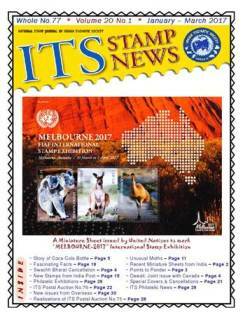 in Issue No.72 of "ITS Stamp News"
Detailed list of "ITS Postal Auctions"
Membership for this Society is open for all stamp collectors. 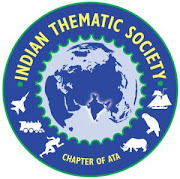 All the members will get quarterly magazine of the society. List of "ITS Postal Auction No.57"
Liat of "ITS Postal Auction No.60"
List of "ITS Postal Auction No.56"
- © Indian Thematic Society - 2017. Ethereal theme. Powered by Blogger.